Over the last two months, dozens of videos and articles throughout the alternative media have detailed a widespread military buildup throughout the country coupled with an increasing amount of urban military training drills that have a strong domestic hint. 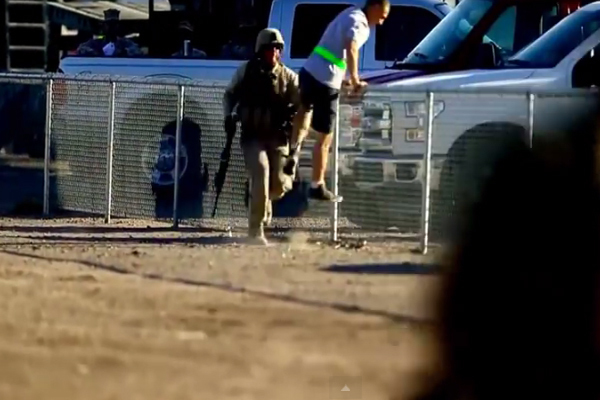 Now, this never-ending saga of new evidence continues with professional video footage taken in Arizona that highlights a U.S. Marines training drill that included armed troops chasing angry citizens who attempted to escape a mock internment camp. Role players playing the part of citizens (American?!) angrily shouted for food and water throughout the video. Multiple role players also simulated an attempted escape from confinement only to be chased down and arrested by armed troops. Military training and planning for some sort of internment of American citizens during civil unrest is hardly new. Multiple military documents and leaks have long exposed this startling truth. In 2012, Infowars reported on a leaked U.S. Army document that outlined plans for re-education camps on both foreign and domestic soil. The report went so viral that a large-scale disinformation campaign was launched to convince the public that the document was only for use outside the country. Firstly, throughout the manual there are scores of references to how the U.S. Army would work together with the DHS, ICE and FEMA (page 24) to implement the policies “within U.S. territory” as part of “civil support operations” in the aftermath of “man-made disasters, accidents, terrorist attacks and incidents in the U.S. and its territories.” (page 38). “Resettlement conducted as a part of civil support operations will always be conducted in support of another lead agency (Federal Emergency Management Agency, Department of Homeland Security)” states page 37. As always the military PR machine and the corporate media are sure to claim that the training was to prepare soldiers for overseas action. Now that the military is brazenly releasing footage, when in the past they would deny this type of training even exists, it allows them to use Orwellian doublespeak to confuse and placate the American people with claims that if the training were for them then they wouldn’t publicly release the footage. Intellihub News and many other alternative news outlets have painstakingly detailed dozens of military training exercises that include role players openly playing the part of American citizens. Just yesterday I reported on Richland County, South Carolina police officers training with US Special Forces in conducting domestic house to house raids. “In yet another startling revelation in the lead up to Jade Helm 2015, Special Forces out of Fort Bragg are currently training with Richland County, South Carolina police officers to provide realistic military scenarios. Not knowing that the next day would provide even more evidence, the report also detailed footage taken in Fort Lauderdale, Florida that showed troops training for what looked to be a martial law style interment of American citizens. The drill, which was held in locations the military refused to disclose beforehand, began on March 17 and ended on Friday. 200 military personnel from all four branches, Air Force, Army, Marines and Navy, took part in the exercise. Broward County also saw similar drills back in March 2014, when Navy SEALS practicing storming a university building from a helicopter. “The sheer amount of documented training to take on the American people by portions of the military and local law enforcement would take multiple pages to fill. Simply put, there is so much evidence that a martial law scenario is being trained for that anyone attempting to deny it at this point either has an agenda or is extremely naive.